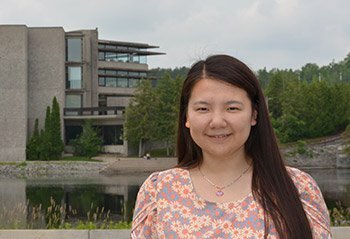 Yiran started her academic career at Trent in the Trent-ESL: English for University programme. Our interview with Yiran was a great reflection opportunity; there was much laughter to be shared in reliving some great memories. What are your fondest memories of studying in Canada and at Trent? Arriving for my studies was my first time in Canada. I was very excited, I had no knowledge of Canada, but I was excited to learn English and experience Canadian culture. I finally understand what a “double-double” is! It was amazing how many different accents can exist in English. I loved being in a place where I could learn English and start taking university courses at the same time. My English teachers were so helpful in steering me in the right direction when I got closer to starting my degree. I met so many international students that I quickly had a large community of friends. This made it so fun to go to my classes! What did you do outside of classes and studying? Being in a university EAP programme allowed me to participate in university activities, groups and events. I was part of the Chinese student association (I was the Vice-president for two years! ), I organized the Chinese New Year dinner and also the Moon Festival. I also got to experience my first Canadian canoe trip and sleeping in the outdoors (in a tent of course), and I went on great trips to famous Canadian tourist spots like Toronto, Niagara Falls, Canada’s Wonderland and more! What was your biggest regret during your experience in Canada? Not going to TIP camp was a big regret. I missed it because I booked my flight too late and the tickets for that date were sold out. I was really jealous of all of my friends who went to TIP camp. They talk about it years later. I just remember that all my friends who went to TIP camp had so many more friends than me! Did you learn anything that you didn’t expect to learn? Canadians are so nice! When it comes to studying, I really liked the small class sizes. Keep it small. Students learn better in small classes. The ratio of instructors to students 1:19 is amazing. The professors are so open and approachable. They are real. One thing that impressed me was that the professors’ teaching styles are all so different. It makes learning really interesting. The campus is beautiful. 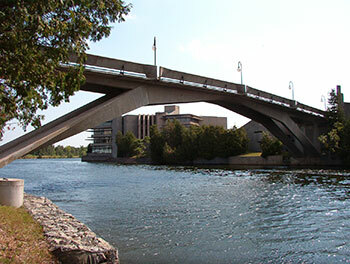 The Otonabee River running through the middle of campus is amazing to see every day. How has studying in Canada formed you as a person? What are your next challenges? I completed a Bachelor of Business Administration with an emphasis in Human Resource Management. Then, I was very fortunate to get an internship with the Peterborough Chamber of Commerce. I learned so much and now I have experience working in Canada which is really important for finding a job. Finding a job is my next big focus. It is so important to network and meet people out in the community. You never know, someone you meet may be the person to hire you one day! Do you have any advice for students considering study in Canada? As a successful student, you need to be social, not just a bookworm. Success comes through meeting people and networking.